We have all sorts of plastic, reuseable, disposable, recyclable serveware, serving ware, and service pieces that you'll need for your next event. Clear plastic serveware is available in all sorts of sizes and shapes for your event. There are salad bowls, serving plates, salad tongs, serving spoons and forks, oval bowls, compartment trays both round and rectangular, mini spoons and forks, picks and stirrers. We have all sorts of other serving ware selections for your events and parties. Check out our plates, bowls, trays, mini spoons and mini forks. Picks and stirrers. Salad tongs and serving spoons and forks. These strong and attractive plastic items are re-useable and disposable. Their prices will fit the budget of about any party. 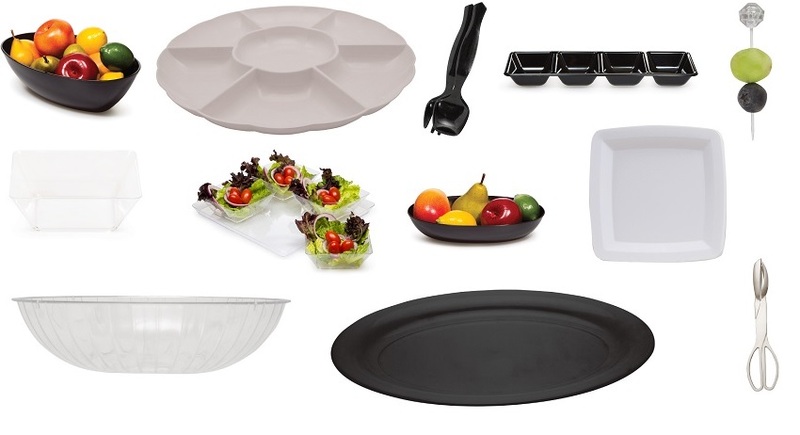 Save with our discount pricing on servingware: 12-23 sets 10% off 24-71 sets 20% off 72+ sets 25% off You can assort your servingware selections to achieve the maximum discount.